Mrs. D. (Olga D'Agostino), an award-winning children's author, was born in western Ukraine. She lived in the historical city of Lviv, where she studied business in Lviv Business College and worked in the food industry. In 1992 she immigrated to the USA with her two small daughters and for years worked in her own business. In 2011, she began her career as a writer, focusing on writing children's books that have meaning and provide valuable lessons. Two of her children's books, Good Morning,World! and The Trees Have Hearts, won a 2013 Mom's Choice Awards. She is a member of SCBWI and speaks a few languages fluently. She lives in the famous town of Smithville, NJ, with her husband Patrick and a meticulous old cat named Nyda. Published children's books by Mrs. D. include Carlo the Mouse on Vacation, The Trees Have Hearts, The City Kittens and the Old House Cat, Good Morning, World!, Runaway Clothes, Carlo the Mouse, Book 1: Too Many Rules for One Little Mouse,and The Little Girl Praying on the Hill ( for older readers). Coming in 2014: The Royal Palm, Carlo the Mouse, Book 2: Now We're Talking! The full series of Carlo the Mouse and her new books The Mysterious Life Inside a Closet, That Is How Things Are (two connected stories: The Autumn Wind and The Kitten and the Sparrow), her new book The Cat Who Wonders By Itself, and three rhyming stories in Who Is Most Important in the Fridge? will be published in the near future. Her books are available in print on Amazon and Barnes & Noble, and as e-books for most popular e-devices. She also likes to write short stories for adult readers. She is presently working on her first novel, The Chinese Princess, and a short story, "A Taste of Bread." For updates on Mrs.D. 's books, please visit her website: mrsdbooks.net. 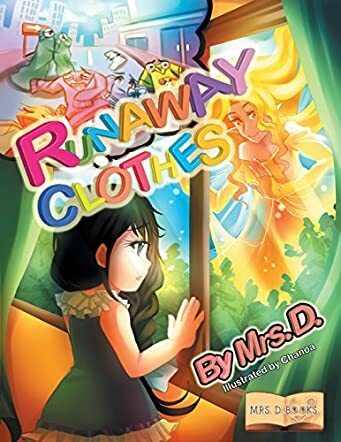 Runaway Clothes by Mrs. D joins this author’s growing list of good quality children’s books. The illustrations in this volume are superbly drawn by the very talented Chanoa, making this a delight to read, regardless of your age. Young Nika awakens one morning to discover all her clothes are missing from her closet. She asks the hangers what they did with her clothes, but only manages to anger them, so the hangers run away, too. After pouting for a bit, Nika realizes she did not treat her clothes very nicely, so it’s her own fault they ran away. This epiphany makes her realize that her toys might also become sufficiently disenchanted to run away, and then how would she cope? To prevent such an eventuality, Nika decides to clean up her room like never before. She puts everything very neatly in its proper place, but is that enough to encourage her clothes to return to her closet? Runaway Clothes is richly illustrated, with a hint of Anime influencing the drawings. The text of the story meshes perfectly with the illustrations; so much so, that you will find yourself pausing on each page to carefully peruse the illustrations after reading the text. Mrs. D has firmly established herself as one of this generation’s premier children’s authors. Readers are encouraged to visit her website, http://www.mrsdbooks.net/ for video trailers for each of her books… a definite plus when you need to select only one or two books out of a dozen or more choices. All of Mrs. D’s books that I’ve so far read have been based on actual events in her life, which makes it very easy to relate to them. If you’ve not yet discovered Mrs. D, Runaway Clothes is an excellent one with which to start. You will grow to treasure all her stories. Runaway Clothes by Mrs. D is full of delightful imagery. The words flow in such a fanciful way that children are sure to be immediately engaged and pulled into the story. Its endearing quality teaches young ones the importance of taking care of their valued belongings in such a way that they will not realize they are learning a lesson in the proper care of one's possessions. Excellently executed! If the colorful writing does not yet engage the youngest of readers, the beautiful illustrations are guaranteed to catch their attention! I believe this book will delight children of all ages. The youngest will be drawn in by the vivid pictures while the older ones will become lost within the lovely descriptive words. They will feel the child's anguish at the loss of her runaway clothes, and later her joy, as she is reunited with them. It is sometimes difficult for me to leave a review and judge someone's work, but this author made it an incredibly easy process for me. Beautiful storytelling, Mrs. D! I am sure it will be treasured by the many children lucky enough to get lost within its pages. An instructive and incredibly beautiful story with a happy conclusion. One morning when the little girl woke up, to her huge surprise, she could not find her clothing. Standing in front of her empty closet, she tries to find out what happened to her clothes and why her favorite dresses, pants, and shirts left her on this misty morning. How dare they leave her with just her summer pajamas? Sound familiar? At first, Nika tries to blame the poor hangers, but the hangers have had enough of her unpleasant attitude, and they run away too. What happens next is a great story about Nika’s realization of her behavior toward her belongings. She finally understands that there is only one person who is responsible for all this mess … and now is the time to take responsibility for her own actions. Any parent knows what it takes to make their children clean their room. Runaway Clothes sparked a needed conversation between my eight-year-old son and me. Without preaching and hammering, Mrs. D. made my young son believe that the clothing and toys have feelings also, and they need proper care and love. No mess in his room! At least for now. As the mother of a young child, I found Mrs. D.s book very useful. It helps me to better understand my son and how I should deal with some extraordinary situations, we are facing when it comes to cleaning his room. This book teaches children to respect their things and make them think about the circumstances. In my humble opinion, this is a brilliant book! What I love the most about Mrs. D’s educational story is her approach to this very touching subject: how to help parents teach their children to take care of their belongings without being annoying. I am amazed how the author lures readers into the world of the young girl, who gradually begins to realize how unfair she was to her belongings. Marvelously executed illustrations lead readers throughout the story while teaching lessons and showing the solutions. The story is written with a touch of magic, which makes this book appealing and memorable. My son loved the magical wind, talking trees, and giggling sunrays. Runaway Clothes is one of these loving stories that young children will enjoy reading repeatedly. It suits both girls and boys. I’ve read all the books by this author. Mrs. D. is an incredible storyteller. Her characters are fascinating, loving, and mesmerizing. They are believable in that they reach hearts, teach lessons, and most important, they are kind and sweet, and fun to read to children. All of her books are beautifully illustrated and very inviting. They give readers new emotions and experiences while transporting them into the magical world of the beautiful classic fairy tales. Excellent teaching tools for children and adults! PS. It was impossible not to fall in love with one of her characters, Carlo the Mouse, who found a warm spot in the hearts of Russian children. They can hardly wait for the next book from the Carlo the Mouse series. I am sure Runaway Clothes will find its readers around the globe and will leave a positive impact on readers of all ages. This is a small book, but it carries huge messages and provides great teaching tools. A brilliant book for young children and an excellent helper for parents! impossible to keep track of them! and learn to put things away properly. Echoes of The Sorcerer's Apprentice are certainly welcome. know, after reading this a messy child might just change their ways! Nika never saw it coming. She was so set in her ways, in her neglect of the things that were important, that it was a complete surprise. The hangars told her, in words crisp and stern. Her clothes had run away. And they were of the same mind, as were Nika’s toys. Why? Because she did not take care of them. What happens when Nika learns her lesson? And what are the lessons learned–by all? I love Mrs. D’s works. Every one of them is a charmer, and every one teaches a lesson. Her illustrator, Chanoa, is gifted beyond telling. Such lovely art work. I loved how the tree friends from Ms. D’Agostino’s “The Trees Have Hearts” were incorporated into this story. Nika couldn’t go outside to play with them, because she didn’t have anything to wear, and the tree friends can be seen waiting for her to come outside. Not to fear–this book isn’t a scary one. There is a misunderstanding that leads to the clothes being returned–all small children will understand the very real reason behind the disappearance of the clothes. But they will also realize the importance of taking care of what they have. And that is the very real message that the author is trying to convey–gently and sweetly, as is her way. Always a treat to read Mrs. D’s books! Runaway Clothes is a whimsical and charming tale that educates children on the importance of taking care of their belongings. Nika is shocked to find that her clothes have disappeared and now her hangers are leaving as well. Bewildered by this development, Nika begins to reflect on her treatment of her beautiful clothes. She remembers that she often threw them on the ground or stuffed them in her drawer. As she cries she notices her toys are scattered about her room. Worried that they too will leave, Nika decides to make a change, but is it too late? The author uses Runaway Clothes to teach children to be grateful for the things they have and to value them through care a respect. The delightful illustrations add to the enjoyment of the story. I highly recommend picking up Runaway Clothes. What a lovely way to teach children how to be neat and tidy and take care of their things. Mrs. D has the innate ability to tell a story in a fascinating way that grips the little readers. She creates a fantasy world where clothes can talk and the elements - wind and sunlight are the character's friends. Her books enable children to believe that anything is possible when you make believe. Children will be drawn into the story by the easy flow of the tale. The beautiful illustrations will delight and mesmerize children. I have read other books by this author and have been in awe at her talent and creativity in weaving stories that are reminiscent of tales of old. I highly recommend all Mrs. D's books to parents who want their children to enjoy reading in a fun and engaging way.